In GD&T, Total Runout controls how much a feature or surface can vary with respect to a datum if the part is rotated 360 degrees around the datum axis. The Tolerance Zone for Total Runout is a 3-Dimensional cylinder with center hole surrounding the referenced surace. As the part is rotated about the Tolerance Zone’s central axis, every point on the part must remain within the cylinder without protruding outside the cylinder’s surface or inside the central hole. Because of this, Total Runout controls both surface irregularities and axial variations. It is commonly used for parts that rotate around a central axis whose entire surface must be in spec for proper functioning. What’s the difference between runout and total runout? Total Runout controls the entire surface while Runout only controls certain circular cross sections. What’s the relationship between Total Runout and Concentricity? Total Runout captures Concentricity by controlling the axial alignment of the datum’s axis to the feature. What’s the relationship between Total Runout and Perpendicularity or Parallelism? 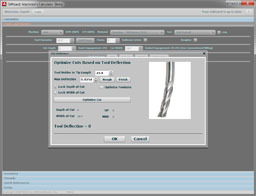 Since Total Runout controls the entire surface, if the feature’s axis is offset from the datum’s axis, the Total Runout will vary from one end to the other. Therefore, Total Runout can control Perpendicularity and Parallelism. What’s the relationship of Total Runout to Cylindricity? Picture the Tolerance Zone for Total Runout: any form variation from an ideal cylinder will show up as increased runout. What’s the relationship between Total Runout and Axis Straightness? Again, picture the Tolerance Zone. If the axis is bowed at any point, Total Runout increases. What’s the relationship between Total Runout and Circularity? Same story–we control the entire surface with Total Runout, so a Circularity error in some cross section shows up as increased Total Runout in that area of the part. Because Total Runout is such a tight control over every point on the surface, it is less commonly used than Circular Runout. Even so, it is still a fairly common GD&T symbol because functionally, reducing Total Runout will reduce vibration and oscillation. It is also a good control for taper on what should be an ideal cylinder. As you can imagine, rotating parts very commonly use Total Runout controls. Total Runout requires a datum, so be sure to include the datum on your callout. Measurement of Total Runout is a typical process for cylinder work. Put the part in a set of V-Blocks so it can be rotated around the axis them measure the total movement of a dial indicator held at constant height against the entire surface being controlled.